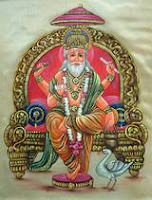 Vishwakarma is the Hindu presiding deity of all craftsmen and architects. He is believed by Hindus to be the "Principal Universal Architect", the architect who fabricated and designed the divine architecture of the Universe, the Lord of Creation. Son of Brahma, he is official builder of all the gods' palaces. Vishwakarma is also the designer of all the flying chariots of the gods, and all their weapons. The Mahabharata describes him as "The lord of the arts, executor of a thousand handicrafts, the carpenter of the gods, the most eminent of artisans, the fashioner of all ornaments ... and a great and immortal god." He has four hands, wears a crown, loads of gold jewelry, and holds a water-pot, a book, a noose and craftsman's tools in his hands. Hindus widely regard Vishwakarma as the god of architecture and engineering, and September 16/17 every year is celebrated as Vishwakarma Puja- a resolution time for workers and craftsmen to increase productivity and gain divine inspiration for creating novel products. Vishwakarma Puja is also associated with the buoyant custom of flying kites. This occasion in a way also marks the start of the festive season that culminates in Diwali.